Graphic tees are one of the hottest trends out there right now. While woven and chiffon tops are here to stay, graphic tees have become just as much of a staple. The last time I remember being really into them I was in high school and most of them had cutesy phrases like “Little Miss Trouble”. At that point, tees were a casual item reserved for days at the mall and school. Now that they have made a comeback, graphic tees can be both dressed up and dressed down. Below I have put together a few looks for you. Check them out! Pair a graphic tee with a pair of comfortable slacks and single strap floral sandals and you will have an effortless look that is anything but casual. Tuck this this adorable muscle tee into a black leather pencil skirt. The leopard print sandals will give the look a bit of retro glamour! P.S.- This entire outfit only costs $90.00! At the end of the day, tees still have a place in the casual area. 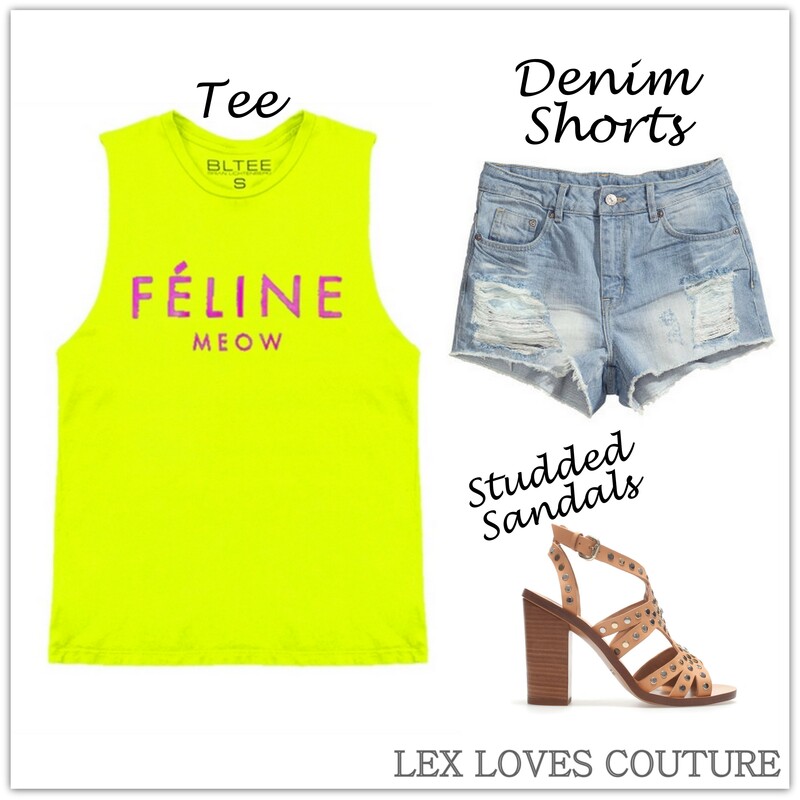 Pair a muscle tee with a pair of high-waisted denim shorts and studded sandals and you will have the perfect weekend look. The awesome tee pictured above is Brian Lichtenberg. It is a hot brand among celebrities. Fashionistas such as Miley Cyrus, Cassie, and Cara Delevingne have been spotted wearing it just to name a few. The funny play on designer brands such as Hermes, Celine (above), and Gucci makes Brian Lichtenberg a head turner. It does not quite fall into the realm of “affordable”, but I would say you can make an exception because Brian Lichtenberg is the brand to have right now. Considering its popularity it is actually quite a deal! There a great many ways to wear graphic tee. Will you be jumping on the trend?